Cologne - FC Bayern München have acquitted themselves exceedingly well in the absence of a handful of first-team regulars this season, but it would appear that their biggest test is still to come. As if injuries to chief attacking outlets and weren't enough, the Bundesliga leaders now face the prospect of having to negotiate the business end of the campaign without Austrian all-rounder David Alaba. Sadly for Pep Guardiola, it's a recurring theme. Not once since taking over the hotseat from Jupp Heynckes in June 2013 has the Catalan been able to boast a clean bill of health. Holger Badstuber, Bastian Schweinsteiger and Javi Martinez have all been in and out of the side, while a string of cruciate knee surgeries have restricted Thiago Alcantara to just 16 league starts in almost two years at the club. To his credit, the Bayern head coach has been able to work around each and every setback, for the most part to great success. His first season at the helm yielded winners' medals in the UEFA Super Cup, FIFA Club World Cup, Bundesliga and DFB Cup, and his second could yet end with a clean sweep in the league, Cup and UEFA Champions League - even if the last few weeks have thrown up the odd hitch. The long-awaited return of talismanic captain Philipp Lahm following almost four months out nursing a broken ankle was offset by an unexpected 2-0 loss to Borussia Mönchengladbach that saw 17-goal leading scorer Robben leave the field of play after just 24 minutes with an abdominal tear. With Ribery already sidelined, Bayern looked uncharacteristically pedestrian thereafter, succumbing to their first home defeat of 2014/15. If, however, there was one positive to be gleaned from the game, it was the performance of Alaba - perhaps the only man in a Bayern shirt who continued to recycle the ball to great effect until the very last. It's a quality Guardiola demands of all his players, but one that only a select few can manage with such ease. What next, then, now that Austria's Player of the Year has been ruled out for seven weeks with a medial knee ligament injury? 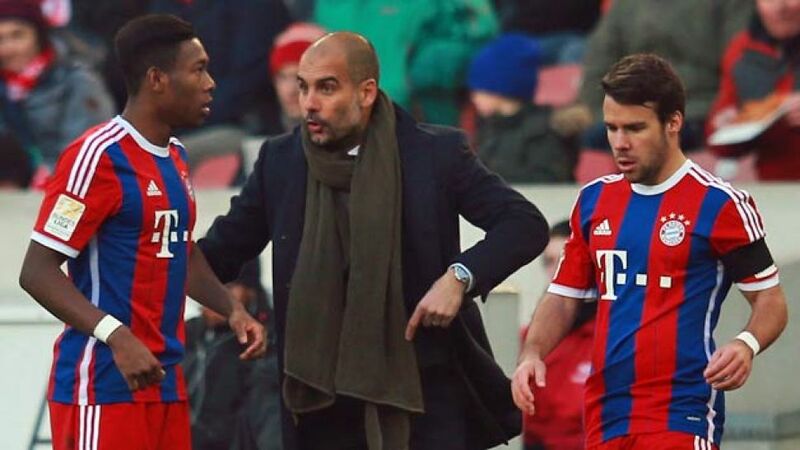 Alaba's versatility means he can play on the left wing, in defensive midfield and at the back. While Guardiola at least has minimal cover in each position, his options in the grander scheme of things are limited. As long as Ribery is missing, Bayern only have one natural left-sider in Juan Bernat, and only a few makeshift alternatives on the opposite flank to fill in for Robben: namely Thomas Müller, Sebastian Rode and Mitchell Weiser. Ordinarily, the Dutchman's absence wouldn't be such a problem, but Bayern have designs on the treble. Indeed, in the next three weeks alone, the record German champions face Borussia Dortmund, Eintracht Frankfurt and TSG 1899 Hoffenheim in the league, Bayer 04 Leverkusen in the quarter-finals of the DFB Cup and FC Porto in the last eight of the Champions League. Yet if Guardiola can deal with that testing run of fixtures, the impending return of Robben and Co. could supply the necessary shot of momentum to get Bayern over the domestic finish line. And who knows? With the 2014/15 Champions League final pencilled in for 6 June, we might still see Alaba in action before the season's out.